Hello you’re looking at a Greenlight 1:18 Sam Hornish Jr signed diecast that has been customized to its proper livery....please see all pictures for conditions and ask any and all questions before bidding...I’m starting this auction at $1 so here’s your chance to add this car to your collection...Thanks ***This will be shipped in a Greenlight Box but not the original box it came in. Condition is Used but in good condition. In perfect condition. Display case size is 7 x 3 x 3". This was the era of active suspension and heavy electronic driver aids which pushed the limits of the cars and drivers. Prost was known as"The Professor" for his smooth and analytical style. In1993 Prost started every race from the front row. In perfect condition. Magnificent and Rare. BBR 1:20 Scale Hand Built 1997 Ferrari F310B Schumacher GP Australia - Broken. Previously owned. Was a superb model until previous owner dropped it. I've carefully reviewed parts vs. photograph of new BBR model and cannot find any parts missing. Sponsors: Stewart, Ford, HSBC, MCI World, Bridgestone. t, Coulthard, Hakkinen, Alesi, Berger, Ferrari, Williams, Mclaren, Formula 1. Display case size is 7 x 3 x 3". Condition is Used. When applicable, serial numbers are recorded to avoid fraud. New ListingMika Hakkinen 2001 Minichamps 1/18th McLaren Mercedes MP4/16 . Mika Hakkinen 2001 Minichamps 1/18th McLaren Mercedes MP4/16 .. Condition is Used. Shipped with USPS Priority Mail. Never Used- Plastic Case--Paul's Model Art- Minichamps-Mint Condition.1.43 Diecast..Team Penske.Limited edition 8,888 pcs. Penske PC 23 ILMOR/d..Indy 500 1994. Al Unser jr. Indy Car World Series Champion 1994. There is a slight scratch on the side of the case..not deep. Professionally built and finished the model has no visible flaws and is in excellent condition. Sheet foam above adds further protection. Included are. Edition 43, Number 24. Edition 43, Number28. Edition 43, Number 45. This is the case with extra wear. Edition 43, Number 53. Limited Edition, 1 of 3,333 made. Minichamps/lang 1:18 Lotus Renault Ayrton Senna diecast. Beautiful rendition of Ayrton Senna's first F1 winning Lotus. Only opened for inspection, and comes from smoke free home. Payment expected within 3 days of auction end. Condition is New. Car is in perfect condition and box shows very minor shelf ware if any. A perfect addition to any collectors die cast collection. Item is as shown. 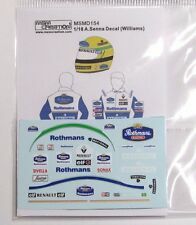 Minichamps/lang 1:18 Williams FW16 Renault Ayrton Senna diecast. Beautiful representation of Ayrton Senna's last ride from that fateful day at Imola. Only opened for inspection. Comes from smoke free home. Payment expected within 3 days of auction end. They all include a display case. CONDITION: Overall the cars are in very good condition. Plastic window has a slight tear. t, Coulthard, Hakkinen, Alesi, Berger, Ferrari, Williams, Mclaren, Formula 1. Bryan Herta 1/18 Shell Reynard Action. Condition is Used. Stored in smoke free home. Car is flawless, box sleeve shows shelf wear. Hotwheels 1:43 2001 Michael Schumacher Ferarri F1 Rare . Condition is Used. Bought back in the early 2000’s. The car is and display is mint condition. The clear protector case has some minor scuffs / scratches. Sold “as is”. New Listing McLaren MP4/14 Mika Hakkinen 1999 F1 World Champion. McLaren MP4/14 Mika Hakkinen 1999 F1 World Champion.. Condition is Used. Shipped with USPS Priority Mail. New Listing1/43 Minichamps Rare T.Takagi 1999 Arrows A20 F1 Car . Tamiya 1/20 Brabham bt46 Alfa Romeo pro built pro built . Condition is Used. Shipped with USPS First Class Package. Previously owned. Check photos closely. Weight of car in display case. 7.5 oz. Sponsors: Ferrari, Shell, Agip, Fiat, Goodyear. Previously owned. Display case will then be wrapped in bubble wrap and will float in a larger box filled with foam peanuts. Condition: New Sealed in Box. Color: Silver. The model is in excellent condition. The number on the model is 1. LOOK at the pictures. I showed the flaws in the box very clearly. Spark 1/43 Williams FW36 #77 Valtteri Bottas 3rd Abu Dhabi GP 2014. Listed as used but briefly displayed.In excellent condition, like new. Free shipping with USPS First Class. BLEMISHED BLISTER - SEE PICS! This diecast car is from an extensive plastic and diecast model collection kept in an indoor, smoke-free,dust-free, heated and air conditioned storage unit. This model is new, has never been displayed, and has never been removed from its sealed box. F1 1/43 Nigel Mansell 1995 McLaren MP4/10 Mercedes New Formula 1 Minichamp. Condition is New. Shipped with USPS Priority Mail. 1/43 Minichamps Rare T.Takagi 1999 Arrows A20 F1 Car . Diecast models are among the most popular toys on the planet. Many widely see Formula 1 GP racing as the pinnacle of motorsport. Names like McLaren, Ferrari, and Renault are as often seen gracing toy cars as they are screaming around the racetrack. With diecast toys, you can build your own collection out of model cars rather than spending millions of dollars like Red Bull to field a competitive racing team of F1 cars that you can't drive on the streets anyway. What is a Racing Formula? Engines: All cars must use a 1.6 Liter turbocharged V6 with one turbocharger limited to 600 horsepower. They can also use a power recovery system that can add up to 160 horsepower for short periods of time. Weight: Each car must weigh no less than 1616 pounds. Aerodynamics: Each car may have two wings to generate downforce, one at the front and one at the rear. Bburago: Now part of Maisto, Bburago makes highly detailed F1 models for collectors to display as well as officially licensed Ferrari models. They are a great addition to any model car collection. Minichamps: With models including McLaren and Brabham, German manufacturer Minichamps produces a wide range of Formula One scale models for collectors of all ages. Hot Wheels: A company that has been making model cars for 50 years, Hot Wheels has brought Formula 1 cars into millions of households. Hot Wheels lets children unleash their inner Ayrton Senna or Michael Schumacher as diecast cars race around scale tracks. Condition: A Mercedes model still in the original box without a mark on it is going to be more desirable than if the box or the race car shows signs of wear. Rarity: The more limited the release, the more unfulfilled demand will drive up the price. Content provided for informational purposes only. eBay is not affiliated with or endorsed by any of the brands mentioned above.